Seven days into our trip and this is it: the focus of our entire journey. Mule deer and pronghorn are all well and good but today’s the day we’re going into Yellowstone to find wolves. Camera batteries have been charged, memory cards formatted and lenses polished in preparation, and it’s with a sense of genuine excitement and anticipation – like a ten year-old at Christmas – that I pull back the curtains in our simple room to let the light shine in and the day begin. While a window as modest as those here at Chico was never going to deliver a Grand Central-style beam of light to match the occasion, the reality still comes as a serious disappointment. Gone is yesterday’s brilliant sunshine, clear blue sky and a promise of “a heck of lot of wildlife”. In its place is a low dull greyness, drifting snow and the prospect of not actually being able to see whatever wildlife decides to brave the weather today. Ah well, an overcast day in Yellowstone has got to be better than a sunny day just about anywhere else so within an hour of waking – it would have been sooner had we not had to wait for a table at breakfast – we’re once again on Route 89 heading for the park. And from the word go, it’s a completely different experience, (and not just because of the park ranger who admonishes us, unnecessarily aggressively, for pausing to watch a couple of elk make their way through a No Pausing Zone). Where yesterday’s landscape had seemed idyllic, a land of milk and honey for the region’s herbivorous browsers, today’s Yellowstone is cold and bleak, a chill wind blowing waves of snow across the road. The wildlife encounters are different too. During one of our frequent scenery stops along the often narrow road east from Mammoth to Tower-Roosevelt, a herd of bison emerges from the thick vegetation 100-150 yards behind us. 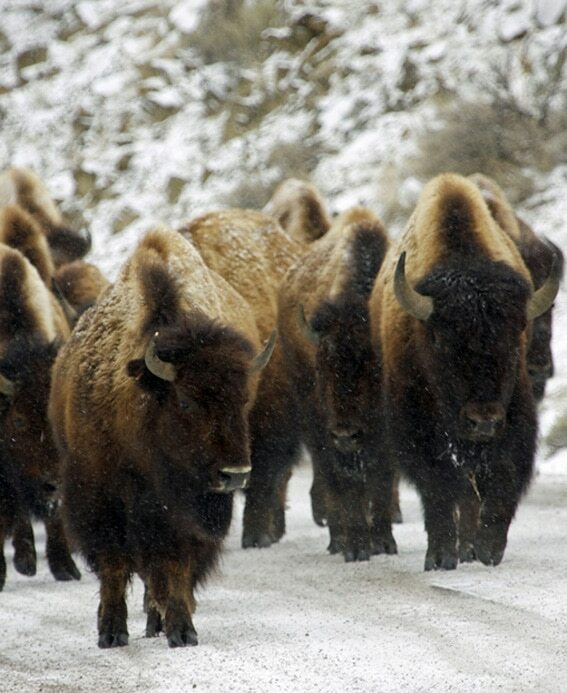 They largest males moves into formation to create solid wall of snow-dusted forehead and steamy exhalation, and lead the way towards us at a pace that seems to be slightly faster than the usual bison amble. We’ve got full collision damage waiver on the rental so the worst that’s likely to happen is we’ll be inconvenienced if they get ahead of us, but the latent power of these beasts, particularly in large numbers, is enough to persuade me to move on. As the landscape opens up we spot solitary bulls and small groups of three or four animals making their way along the valley, heads down against the snow and wind in scenes as primitive as the landscape itself. And then, in quick succession, we spot our first carnivores. Both are coyotes, but behave very differently. One sits on the brow of a small snow-covered hill overlooking the road, but spooks as we slow down and quickly disappears from view. The second, far more confident, turns to watch as I leap out of the car to grab a photo, before continuing on his way as if we weren’t there. I know coyotes are considered vermin by many and are shot without a second thought, but to these visiting Europeans they’re second only to the elusive wolf on the canine tick list. And shortly afterwards, it happens. We’ve just entered the Lamar Valley when Carole decides she needs to answer nature’s call and we retrace our steps to a restroom facility at the junction with the road to Slough Creek. We’d passed by no more than 15 minutes earlier, and there’d been no one there. Now there are maybe a dozen or more people standing outside their trucks and SUVs, peering intently into spotter scopes focused on the hillside opposite. We squeeze into a space on the parking lot, wrap up warm against the snow and get out of the car with a pair of binoculars. After a while of gazing into the distance, the idea of actually seeing anything fading in inverse proportion to the ferocity of the blizzard, I ask the woman nearest us what we’re looking for. Oh wow. Please, please make an appearance. The waiting game continues and, in the absence of an immediate sighting, I take to observing the observers. Some are in compact sedans, back seats lost beneath clothes, blankets, food wrappers and the other detritus that collects on a long trip; others are in pick-ups and SUVs, expensive-looking spotting and radio communications equipment neatly arranged for instant accessibility. Some are glued to their scopes while others warm their hands on mugs of coffee and chat about wolves and the weather. It’s soon apparent that while we may all be here with a common purpose, these are people who take their wolf-spotting seriously. Not for them a couple of days in the park with the vague intention of stopping every now and again and “having a look”. Some of these people make their way to Yellowstone every winter and spend literally months tracking the movements and relationships of the park’s various packs. “You’re English yourselves aren’t you?” asks the woman I’d spoken to earlier, confirming that not only is this a mixed bunch but an international one. After completing the usual “Which part of the country are you from?” pleasantries, she asks if is this our first visit. “No, we try to come every year,” I answer, misunderstanding her question. Hierarchy established (she’s a wolf-tracker, we’re tourists), we return to watching the hill opposite. And then we hear it, a distant but distinct howl. Smell is reckoned to be the most evocative of the senses (old log cabins do it for me) but this plaintive sound is something very special indeed. Sharing its exact location proves trickier than I would have imagined – the power of wildlife scopes means once they’re focused in on something it’s not always easy to regain the big picture – but eventually we see it: the unmistakable form of a wolf, dark gray, perhaps even black in colour, making its way across the snow. Even with reasonably good optics – Carole has the binoculars, I’m looking through a 400 mm camera lens – it’s like viewing the world through a 1960s TV that’s receiving a fuzzy black and white signal via one of those Christmas tree set-top aerials, but it really doesn’t matter. I am in Yellowstone and there’s a real, live, wild wolf on the hillside opposite. Or at least there was. It disappears into a perfect camouflage of snow, rocks and shrubbery just as quickly as it emerged a minute or so ago. The trackers may be frustrated but the tourists depart elated. Mission accomplished. 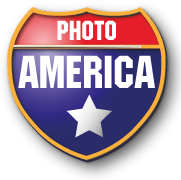 This entry was posted in Yellowstone wolves and tagged bison, buffalo, coyote, elk, lamar valley, mammoth hot springs, montana, wolf, wyoming, yellowstone.